Phone Number of 5Dimes is 1-800-430-5896 . 5dimes is a group that provides users with online gaming experience. It is based in San Jose, Costa Rica and was started first time in November 1996. 5dimes serves users with online gambling experience which can be reached through their main website. 5dimes group provide over 1000 options of wagering everyday. 5dimes also provide Casino facilities of over 200 games which include Baccarat, Video Poker choices, Roulette and many more. 1.5dimes sports book: which consists of sports wagering to Bet on sports and games. 2. 5dimes Casino: which is comprised of many games as described before. 3. 5dimes Mini Games: which are meant for Android/computer and Apple mobile phones. 4.5dimes Racebook: where you can bet on horse racing. 5.5dimes Lottery: which contains many offers. 5. 5dimes Poker: which contains different Rooms as per your need. Below mentioned are some Policies and Rules that are made for the benefit of users and the user must follow them. 1. The Age of the user must be 18 years minimum. 2. French Users are not allowed to play/register with 5Dimes Group. 3. It is recommended to change your password after every 2 months. 4.5Dimes should be notified immediately if a player has found that 5dimes has posted an inaccurate line/time error. 5. Administration have full rights to detach a player from a reward program whenever they want. 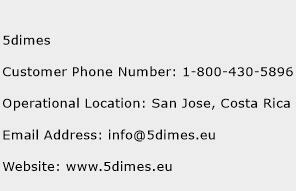 The address of 5Dimes is San Jose, Costa Rica. The email address of 5Dimes is info@5dimes.eu. The Website of 5Dimes is www.5dimes.eu. The customer support phone number of 5Dimes is 1-800-430-5896 (Click phone number to call). The postal and official address, email address and phone number (helpline) of 5Dimes Service Center and 5Dimes customer service phone number is given below. The helpline of 5Dimes customer service phone number may or may not be toll free. I logged into my account and saw I had a $191 balance. But I could not bet it read sportsbook suspended call customer service. I call and they ask for my Account and password, give it to them and guy says "wrong password"
I then say "well how it is I'm in and looking at my balance if wrong password? He did not know just kept telling me wrong password, so 5Dimes. Eu just stole my $191 as I can not do anything. Account is 5d2012453.